I visited Lukshon shortly after it first opened. I remember going in with low expectations, but came away thinking that it was one of the stronger haute Asian restaurants in the city. Given that visit was almost two and a half years ago another trip was definitely in order. As is our wont we began the meal by working our way down the cocktail list. 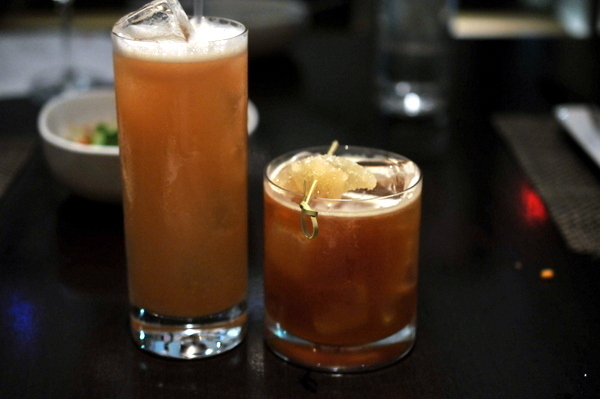 The Lukshon sour was a riff on the classic whiskey sour; the frothy libation had a pronounced acidity tinged with a ripe funk from the tamarind. 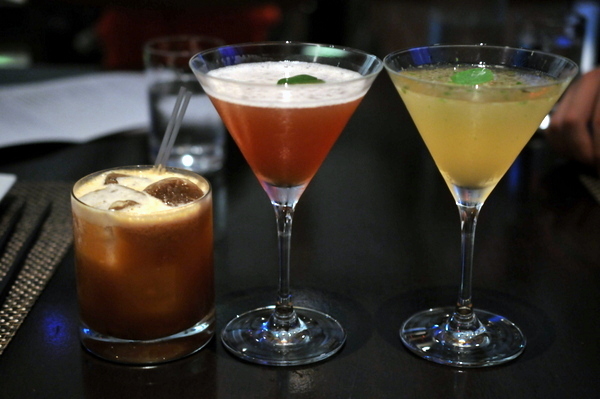 The Yokohama Romance was the strongest of the three cocktails with a cool boozy kick shaded with a light grape-y aftertastes. The Gimlet was my favorite of the trio, an urgent blend of heat and acid overlayed with the soothing fragrance of fresh basil. 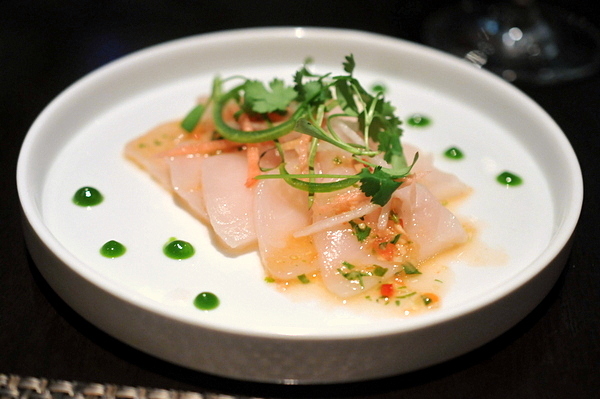 The meal started with a sashimi of Hawaiian Butterfish. The fleshy texture of the fish stands is stark contrast to the crisp duo of radishes; likewise the fatty savor of the fish is amplified by the tang and astringency of the pickles. The pig ear terrine tasted like it would be right at home on a ping pan, cool jellied bits offered a mix of offal and porcine essences while a smattering of pickles brought some levity to the dish. For me the highlight was the fried pig ears; their rich oily savor served to augment the more subdued character of the terrine. I enjoyed this salad far more than I thought I would. 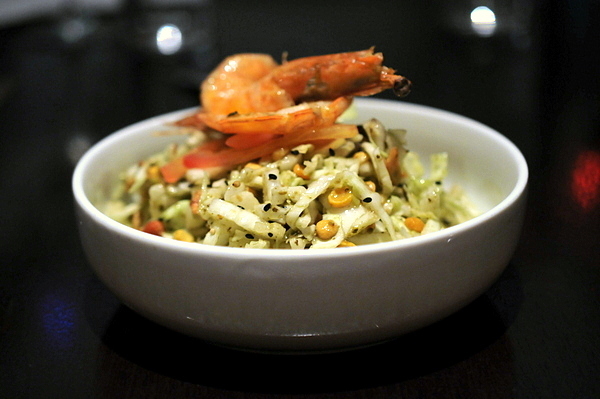 The multifaceted crunch of the cabbage, legumes, and nuts is tinged with bitter vegetal and warm toasty notes while the sliver of prawn adds a satisfying accent of shellfish and butter. The steamed cod was one of the few letdowns of the night for me. I found the fish a touch mealy, with a whiff of earthy and fishy notes though my companions seemed not to notice anything amiss. 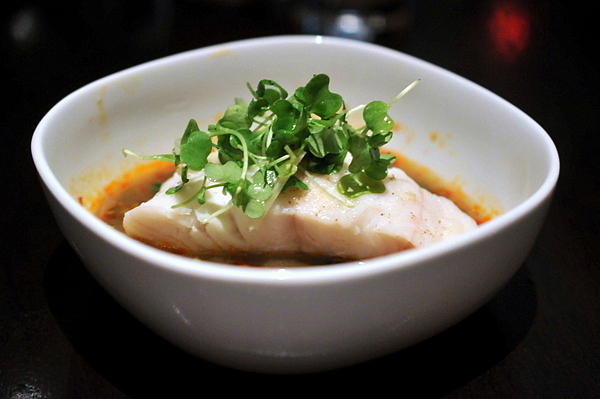 Despite my issues with the cod, the broth offered a deep spicy twang that I found quite enjoyable. Continuing down the cocktail list we have the Singapore Sling, built around an aromatic backbone of gin and benedictine, the drink has a restrained bitterness coupled with the muted essence of pineapple. The Fujian Cure was my favorite cocktail of the night, blending citrus and fragrant tea beneath an overarching essence of whiskey smoke. I'm a sucker for poached eggs so this was definitely a must order for me. 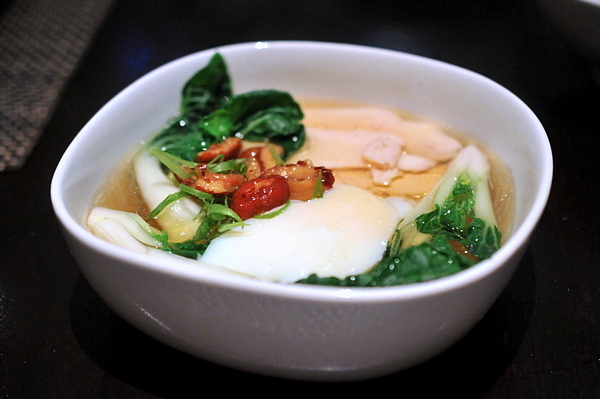 The combination of precisely cooked chicken, noodles, and bok choi is satisfying but the inclusion of the egg brings this dish to another level. Mixing the runny egg into the broth gives it a silky mouth feel while simultaneously adding a touch of hearty weight to the soup's simple clean savor. 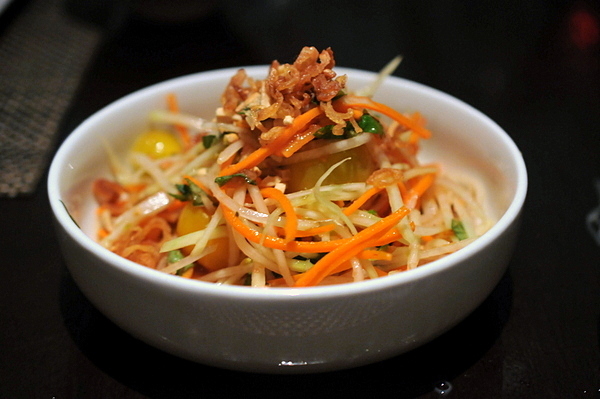 The green papaya salad was a nice change of pace from the previous dishes. Cool, crunchy, and quite refreshing, the melange of vegetables exude a tightly coupled fusion of acid, spice, and a bit of funk for good measure. 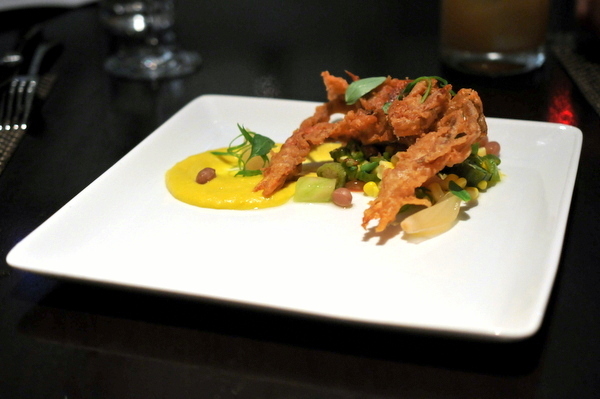 I've never been a huge fan of soft shell crab; while the shell is edible, the plasticky feel is a bit disconcerting. Fortunately the shell was barely noticeable in this preparation, making it easy to fully appreciate the crunchy batter and brine-soaked flesh of the crab. The accompaniments were equally enjoyable, with the bold tropical sweetness of the "creamed corn" and piquancy of the pickled okra and assorted vegetables equal to the task of balancing the crab. 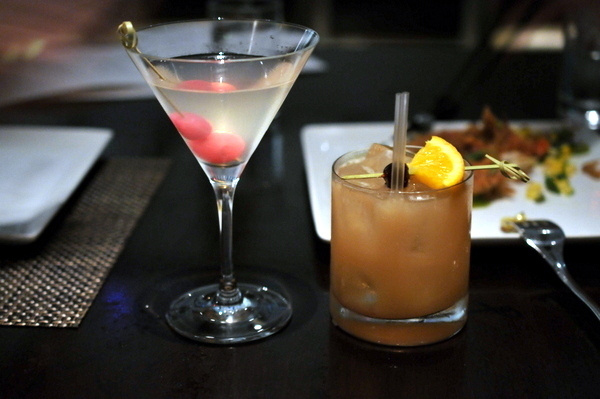 The Formosa was effectively a gin martini with a bit of Taiwanese rice wine thrown in, a bit stiff for my tastes. The final cocktail had the easy-drinking sweetness typically associated with Mai-Tais muddled with a bit of savor from the five spice. 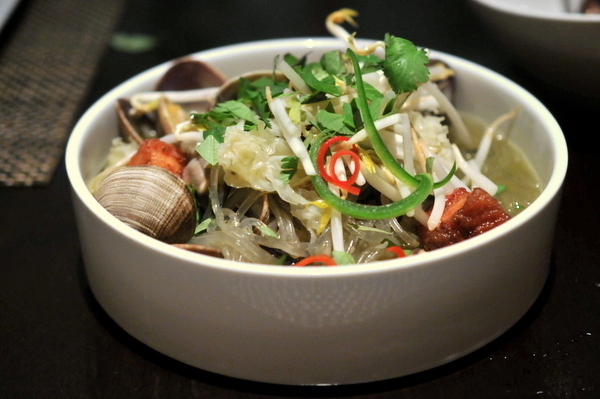 This was one of my favorite dishes of the night even though the clams played a relatively small part despite being the headlining ingredient. Instead it was the fragrant broth, reminiscent of pho, coupled with the fried pork belly (glorious bits of rendered fat wrapped in a crispy exterior) that stood out. I had an image of how this dish would play out in my mind and the implementation was pretty much spot on. 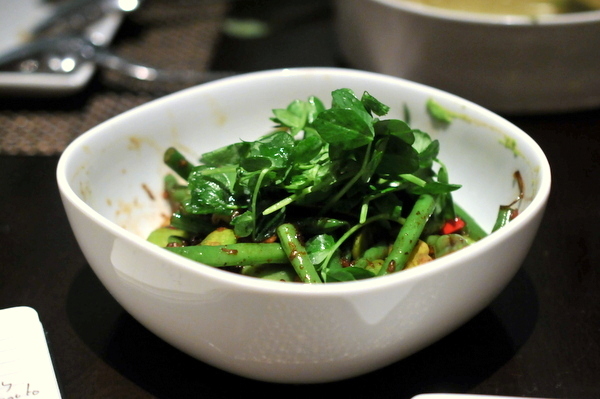 Built around stir-fried haricot vert, the green beans offer savor and heat with a pleasing crunch to boot. Moving deeper through the bowl, the favas offer a nutty warmth while the base of English Pea puree has a nice cool grassiness . We would have probably skipped this course were it not provided as a gift from the kitchen. 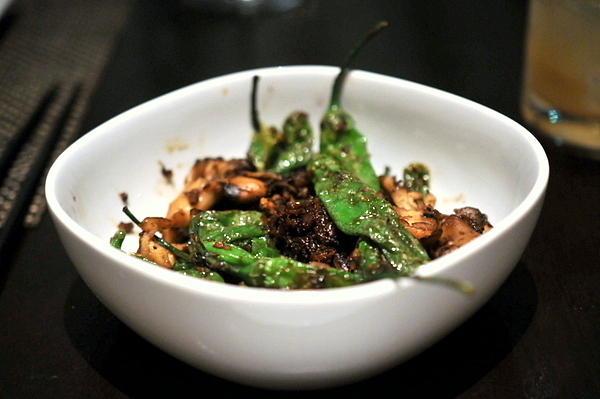 The peppers were classically prepared and would have been forgettable but for the woody charm of the maitakes and the umami bite of the XO. Though Lukshon primarily focuses on small share plates they do have a couple larger dishes namely the whole fish and the beef and broccoli. 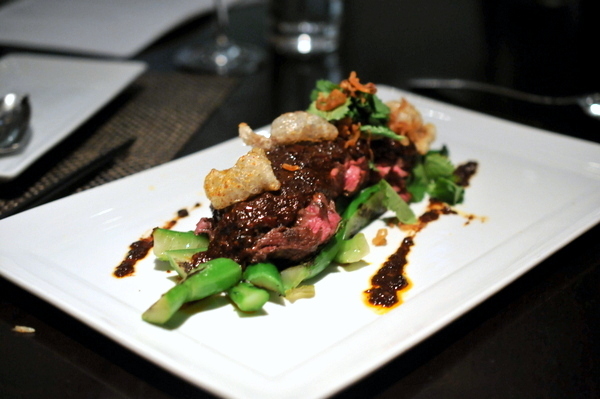 A re-imagined take on the Chinese staple, the beef and broccoli pairs a beautifully tender hanger steak with crisp stalks of Chinese broccoli or gai lan. 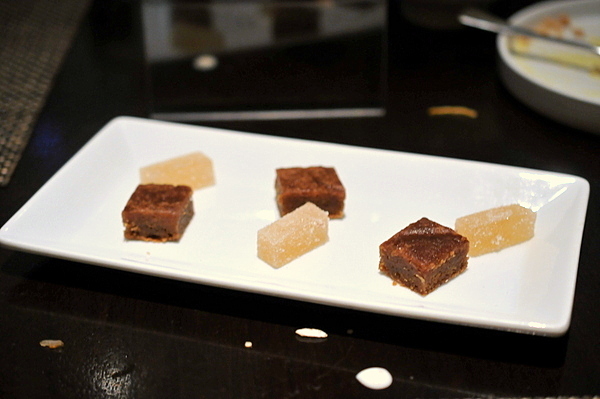 I found the black bean ghee a bit heavy-handed but the earthy funk worked well in small doses. 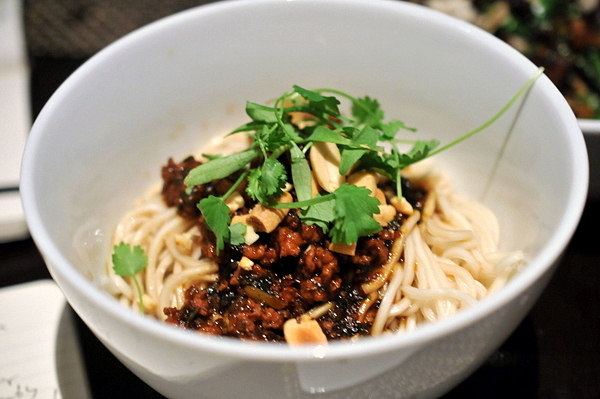 The second of the noodle dishes drew its inspiration from Thailand. 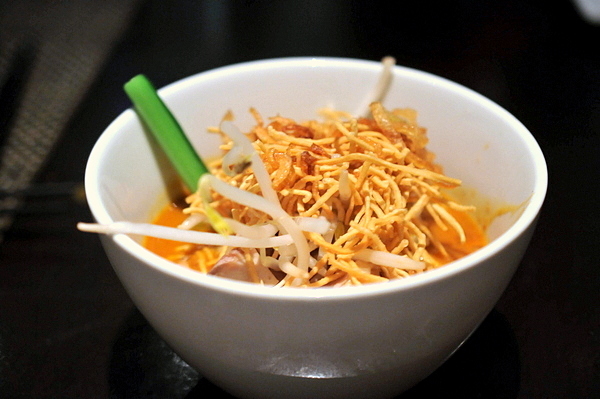 The spicy-sweet curry was reminiscent of of Kao Soy but with rice noodles in place of the typical egg noodles. This is typically a lunch dish, I appreciate the chef taking the extra effort to make this dish for us. I was hoping for something more akin to the stuffed squid from my first visit, but this was a much lighter affair with emphasis on the salad. 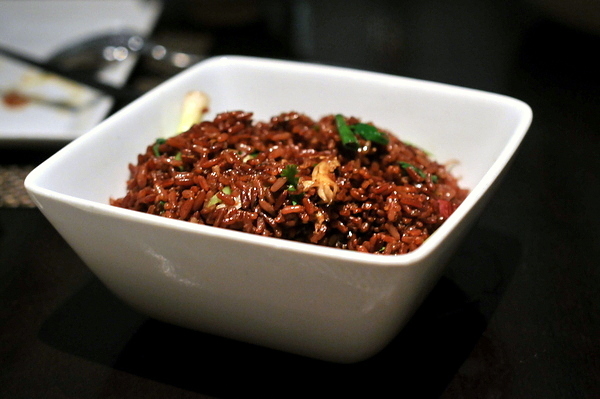 The squid is largely a textural element, a solidly dense contrast to the succulent roughage. 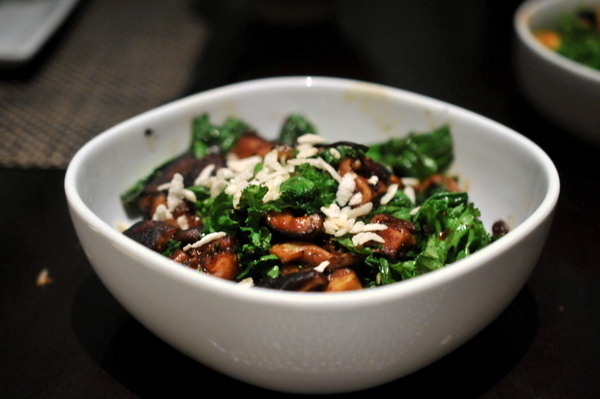 This was pretty much what I was expecting, an earthy mix of mushrooms augmented with dou ban jiang. 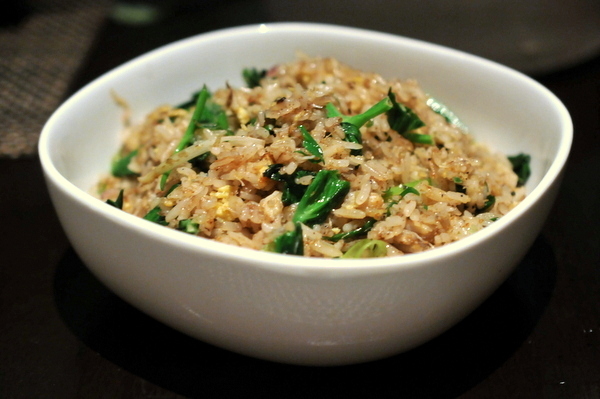 The greens and Chinese sausage are are largely sidelined by the pungency of the fungi. The dan dan noodles remain largely unchanged from my previous visit. Naturally, the most obvious aspect of the dish Sichuan peppercorns thanks to the creeping numbness they induce on the tongue. 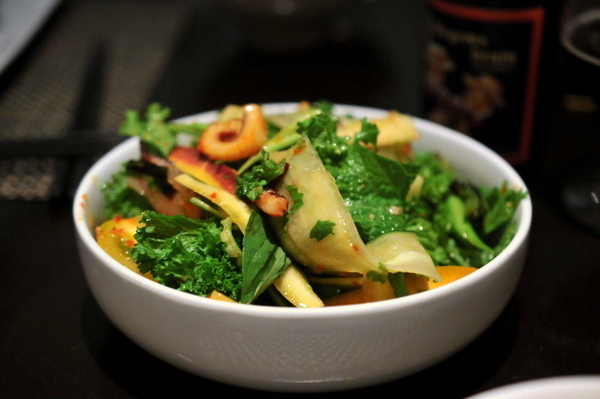 Despite the distraction of the peppercorns, I appreciated the bright pops of piquancy from the preserved greens. Lukshon has augmented its dessert menu since my last visit. 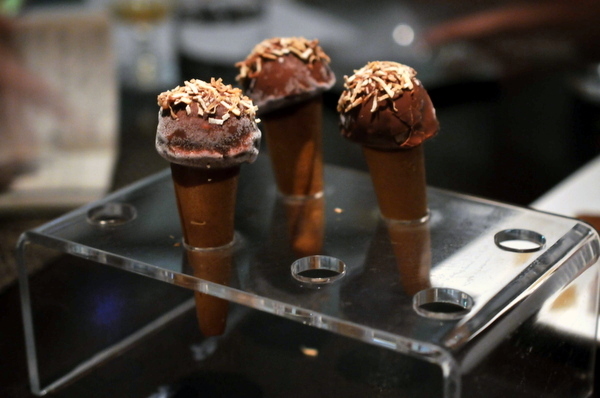 Instead of a complementary taster of simple desserts, the restaurant now has full blown composed offerings that all proved to be quite good. 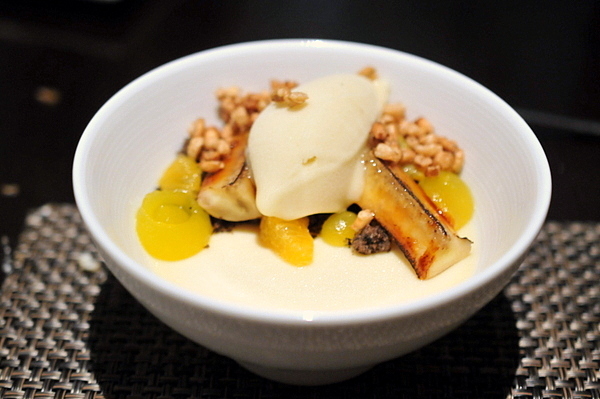 With the bitterness of the streusel, and the toasty notes of the puffed barley this dessert had almost a savory vibe but the caramelized banana and sorbet provide enough countervailing sweetness. This was my favorite of the three desserts. The chocolate cake was moist and light but still full of rich chocolate goodness while the sesame brittle offered a lovely crunch filled with burnt sugar and nuttiness. The Thai chili in the caramel could have been a bit more apparent but all in all a fantastic dessert. Rounding out the meal were three little treats. 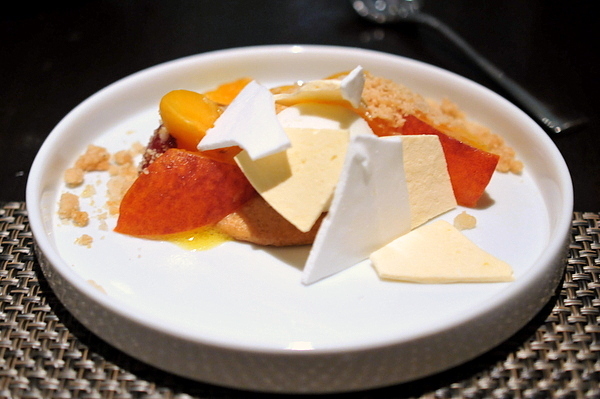 The lychee pâte de fruit was the simplest of the trio tasting like a fresh ripe lychee. 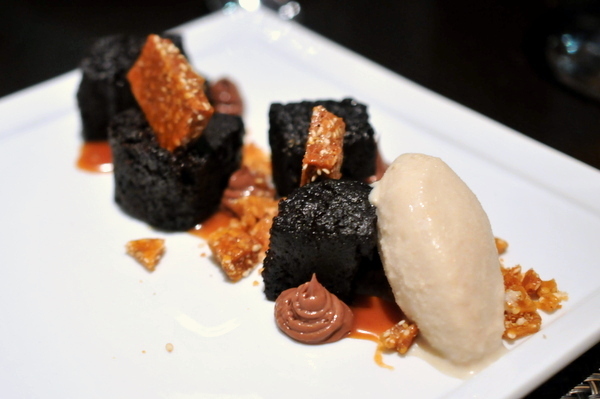 The palm sugar brownie was my favorite of the trio, lighter than a typical brownie the palm sugar flavor was reminiscent of the fantastic blondie I had recently at Connie and Ted's. The ice cream cone worked quite well with a bitter core of coffee ice cream softened by the sugary sweetness of the cone. I'm happy to say Lukshon is just as good as I remember it. 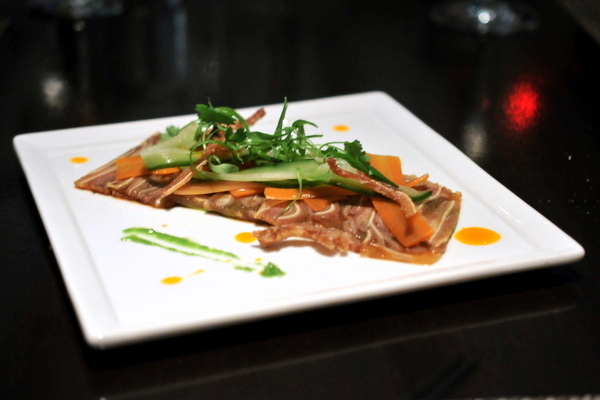 While some of the dishes have remained since the inception, the menu as a whole feels a bit more focused and approachable. One thing to note: there are a lot of commonalities between dishes so towards the end of our meal things started to feel a bit repetitive. In the restaurant's defense, we had all but three items on the menu; so this shouldn't be a problem for people ordering normally. Its well worth a trip, dunno their corkage policy tho. 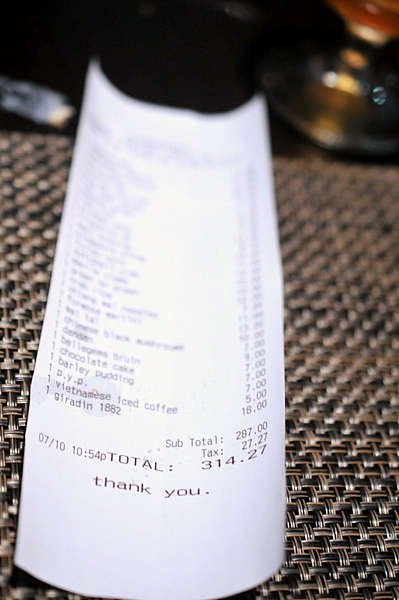 How many people did you dine with?